A guide for choosing the right transducer. Choosing a transducer can be a daunting task. Here’s what you need to know. As we motored through a flotilla of drifting boats on the backside of California’s Catalina Island, Capt. 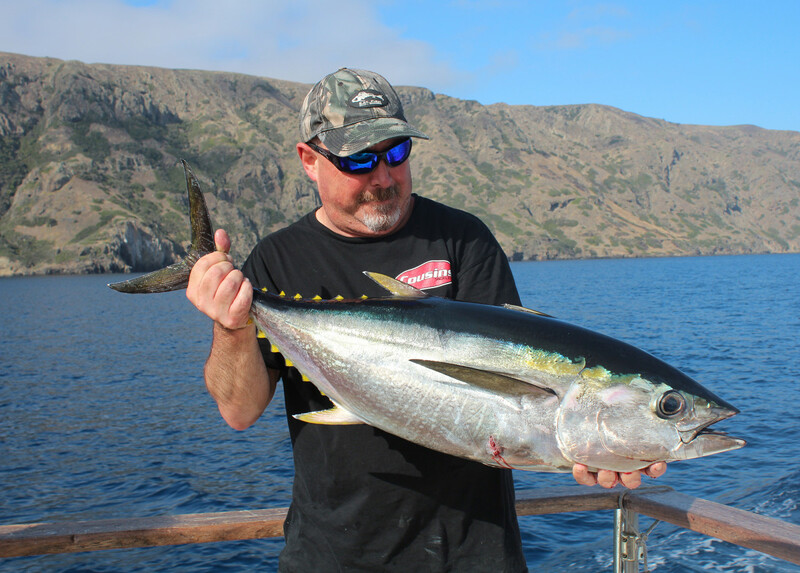 Gary Adams of the six-pack charter boat Rail Time fixed his gaze on the color screen of his Furuno echo sounder. “That boat is on fish,” I pointed out as we idled past a skiff that had two anglers pinned to the bow rail by hard-charging gamefish. Adams muttered something under his breath, never taking his eyes off the screen. A few minutes later, a good distance from the rest of the boats fishing the island’s squid nests, Adams found what he was seeking. The sounder displayed a thick layer of “blue fuzz” — that’s how squid mark on the sounder — compressed toward the bottom, hovering over an area where soft sand bottom met a patch of harder gravel. The worm-shaped marks and strong arches indicated white sea bass and yellowtail lining up like hungry diners at a buffet. Adams’ knowledge of fish behavior and understanding of what he saw on the sounder helped us load the boat with big sea bass, yellowtail and halibut as we drifted over the area again and again, well away from the rest of the fleet. Accurate echo sounder interpretation is a hard-earned skill. And professionals such as Adams are the first to say that none of it is possible without a properly matched and correctly installed transducer. 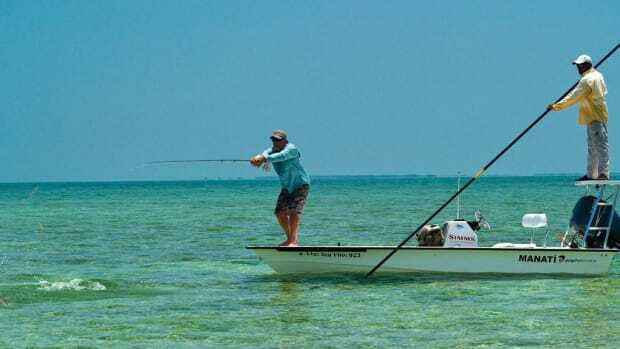 Whether outfitting a bluewater battlewagon, a center console or a skinny-water skiff, today’s anglers face a dizzying array of transducer choices. 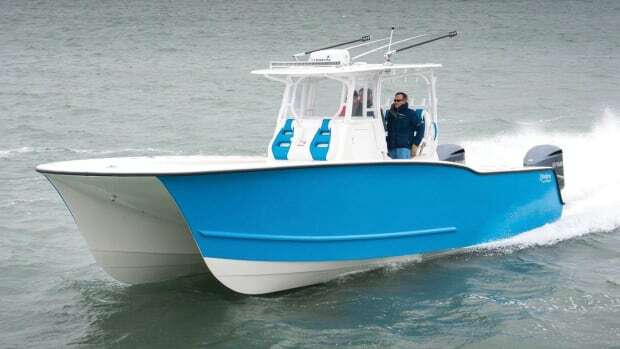 First, you have to figure out what style and installation method make the most sense for the type of boat you own. There are four basic categories: transom mount, through-hull, through-hull flush-mount and in-hull. 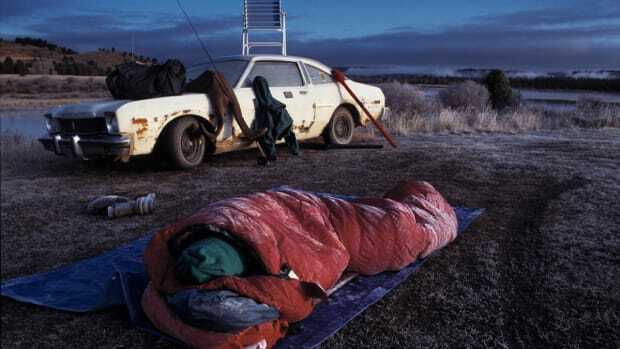 Each has advantages and drawbacks. Transom-mount transducers are popular for smaller boats. They are easy to install on outboard and sterndrive boats built from any hull material, including aluminum. They are designed to mount externally on the vertical surface of the transom using a bracket and mounting screws. This setup eliminates holes drilled through the bottom of the boat — always a stress-inducing activity. And because transom mounts don’t protrude beneath the running surface, you don’t have to worry about them interfering with trailer bunks or rollers. Transom mounts range from compact, dual-frequency models for 600-watt sounders and multifunction displays to larger 1-kilowatt models. These are commonly offered as standard equipment with new sounders and MFDs, and for many anglers they are all that’s ever needed. Today, manufacturers even offer transom-mount transducers that deliver advanced capabilities such as CHIRP sonar and side/down scanning. Through-hull transducers have long been the popular choice for larger sportfishing boats. They require drilling a hole in the hull, and they stick out below the hull’s running surface. They are typically installed with fairing blocks that help channel clean water across the transducer face and help mitigate the effects of the unit on hull performance. Fairing blocks also help accommodate different deadrise angles and keep the beam angle vertically oriented to the bottom for maximum performance. Most through-hull transducers are 1- or 2-kilowatt units suitable for professional-grade sounders and serious offshore use. 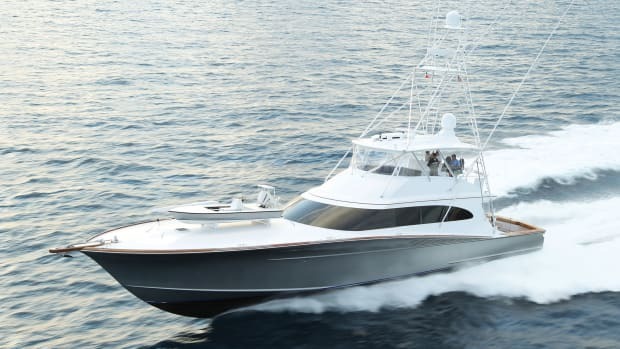 Big center consoles and high-performance stepped-hull designs have fueled demand for flush-mounted, low-profile, through-hull transducers. These models are installed through a hole in the hull, but the transducer element and flange remain nearly flush with the hull bottom. As a result, they don’t affect hull performance or interfere with trailer bunks or dry racks. Many of these flush mounts have tilted transducer elements within the housing, maintaining a vertical beam when installed in hulls of different deadrise angles. These transducers are often installed in pairs, with separate units for the high and low frequencies. When choosing any through-hull transducer, consider the hull material. Transducers with bronze or stainless housings are commonly used in fiberglass or wooden boats. Plastic through-hulls are offered for aluminum fishing boats. However, if the idea of a plastic fitting below the waterline concerns you, stainless housings can be used if steps are taken to isolate the two metals and prevent electrolytic corrosion. In-hull or shoot-through transducers install completely inside the hull and send their acoustic energy through the boat’s fiberglass bottom. This eliminates protrusions below the hull, providing obvious advantages for anglers who prefer to run far and fast in pursuit of gamefish. And because transducers contained entirely within the boat reduce the likelihood of cavitation, they tend to track the bottom very well at higher speeds. You also don’t have to worry about marine growth or maintenance. If you ever have to remove the transducer, you can do so without hauling the boat. In-hull transducers have to be relatively large to compensate for signal strength lost while passing through the hull. You must have adequate “headroom” in the bilge to accommodate the transducer and the fluid tank it resides in. The tank, which is filled with nontoxic antifreeze at the time of installation, compensates for deadrise angle and allows the signal to pass through the hull. This option is only recommended for boats with solid fiberglass bottoms, as too much of the transducer’s energy is lost when the signal passes through cored fiberglass, wood or metal hulls. The simple and nearly universal application for transom-mounted transducers, combined with the fact that they are solid all-around performers, makes them today’s most common choice. And if you’re an all-around angler who wants solid sounder performance under a range of conditions, locations and fishing scenarios, they could very well be the best choice. The more specialized your angling techniques, the more you benefit from tailoring your sounder and transducer system — diving deep into the minutia of frequency options, beam widths, CHIRP and more. Frequency is one of the first forks in the road that anglers approach when selecting a transducer. Higher frequencies (say, 200 kilohertz) have a narrower beam that puts more energy on a target under the boat for better resolution. The flip side is that you have less coverage area. 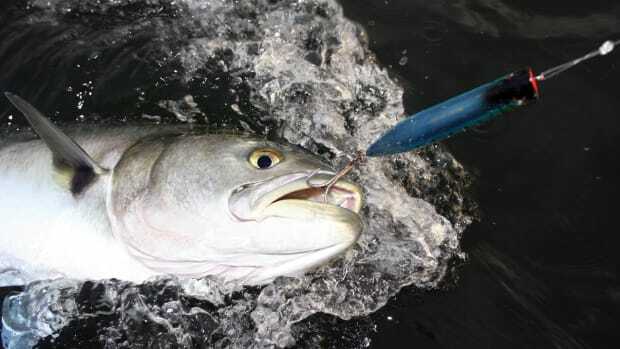 The trade-off makes high frequency transducers most useful in shallow to mid-depth fishing, waters 600 feet or less. Conversely, lower frequencies deliver a wider beam for more coverage under the boat because the acoustic energy is spread over a wider area. While this setup delivers increased depth range and more coverage, fewer cycles per second equates to reduced target resolution. The result seems counterintuitive, as you would think that a narrow, more focused beam would penetrate deeper than a wider, more dispersed one. When you remember that we’re talking about beams of sound, not light, it starts to make more sense. A low-frequency (say, 50 kilohertz) transducer produces a “booming” pulse that carries deeper into the water column, much like the bass from a stereo speaker. 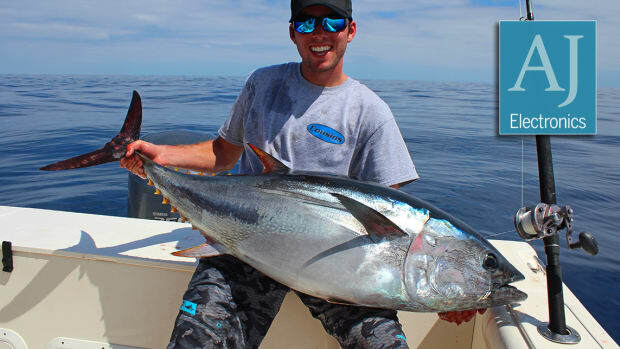 In fishing situations, a high-frequency transducer is generally going to provide the best detail and accurate presentation when fishing over the bottom in depths of 600 feet or less. Because the coverage area is smaller, what you see on the display will be a more accurate presentation of what’s beneath you in real time. For example, as you approach the edge of a wreck or reef, it will show on the display. In contrast, the wide coverage area of a low-frequency transducer may pick up the structure before your boat reaches it, providing misleading information. 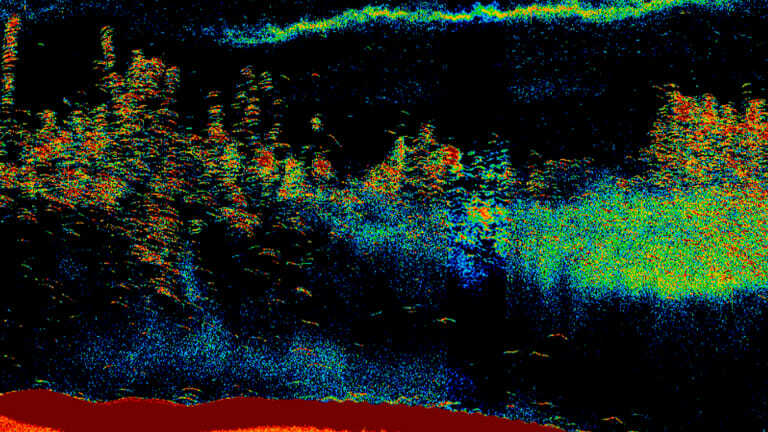 If you want to see structure in detail, understand its orientation and accurately know where fish are holding in relation to that structure, then the focused energy of a high-frequency transducer will help. On the other hand, if your goal is to search out fish suspended deep in the offshore column, then the increased penetration and wider coverage area of low frequency will help. 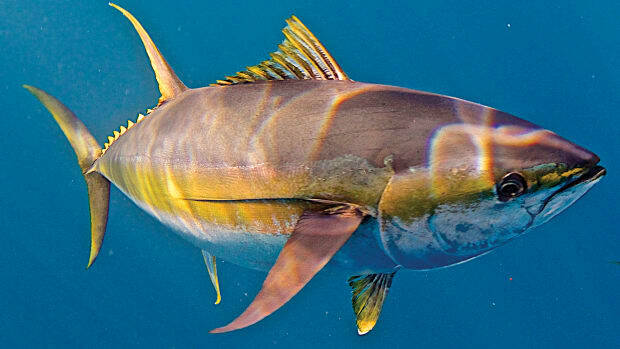 Such a setup would be particularly useful, for example, when searching around or under floating kelp paddies for deep schools of tuna and yellowtail, or when trying to mark single deep fish such as swordfish. The wide coverage area will help you search a broader area and will more likely pick up scattered fish or schools, although with less positional accuracy in relation to the boat. To provide advantages of both versions, many sounders come paired with a dual-frequency transducer. The most common contain 50- and 200-kilohertz elements, but there are variations. The dual-frequency arrangement allows the sounder to display targets detected by low frequency, high frequency or both, simultaneously on a split screen. Beam width goes hand in hand with frequency but should be considered and understood separately. A good way to visualize beam width is to picture two light bulbs of the same power. A 100-watt spotlight shining straight down from the ceiling will illuminate a relatively small spot on the floor. You might miss things on the periphery, but if something happens to be in that spot on the floor, you will see it clearly. Switch to a 100-watt floodlight, and you’ll shed light across a much larger swath. 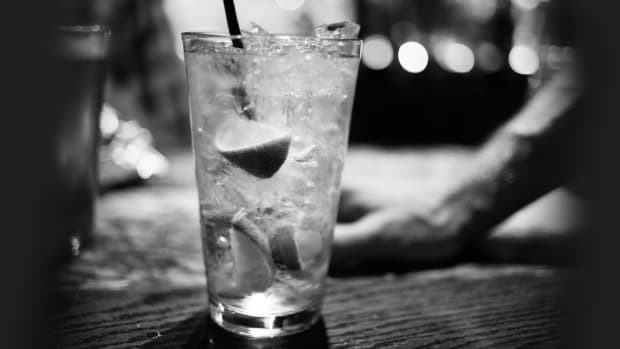 You’re more likely to detect things around the edges of the room, but nothing will be illuminated in any great detail. 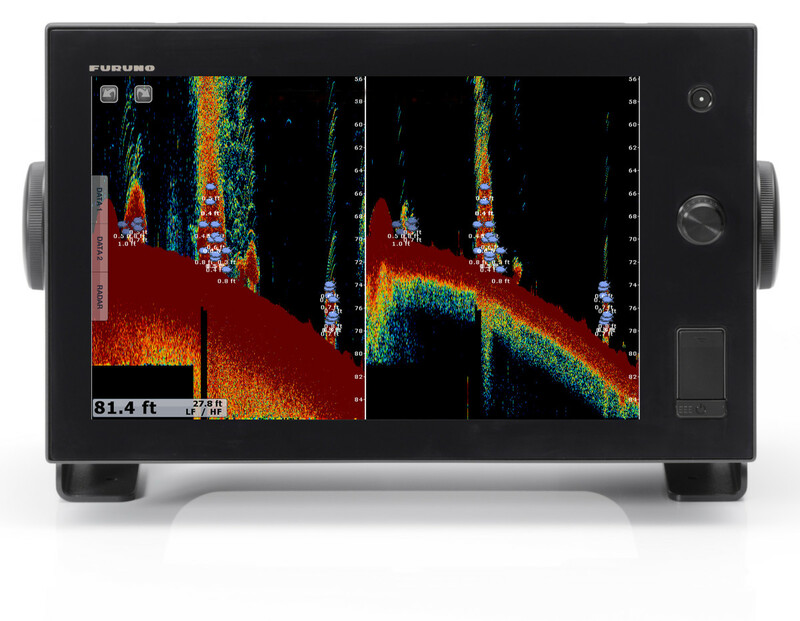 Understanding beam width will help you better interpret what you see on the fishfinder in any operating frequency. 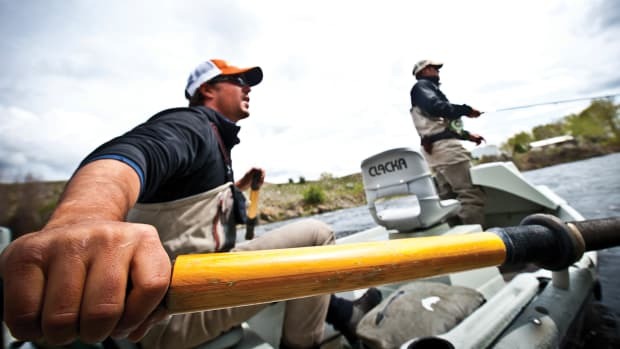 It also can help you tailor a transducer solution that is optimal for your style of fishing. For example, some boaters install a pair of tilted element through-hulls, one each for high and low frequency, and select a high-frequency wide beam that combines the detail of a typical high-frequency transducer with greater beam width and coverage area. CHIRP sounders and transducers utilize a different approach to seeing what’s under the boat and have been gaining popularity for the past decade. Instead of operating on one or two discrete frequencies, CHIRP-ready transducers transmit across a wide frequency band with each pulse — some across a band of 100 or more frequencies — delivering exponentially more target detail back to the display. The specifics of that frequency band can vary depending on the transducer model and its range. Airmar offers CHIRP models in low, medium, high, low/medium and low/high ranges. Most CHIRP transducers also vary beam width as they sweep through the frequency range. The beam is widest at the low end of the sweep and narrowest at the high end. Wide-beam CHIRP transducers, by contrast, have a fixed beam of 25 or 40 degrees across the frequency band for more coverage when searching the water column. With CHIRP, all targets detected in the entire bandwidth are seen on the display, including fish that are close to the bottom. 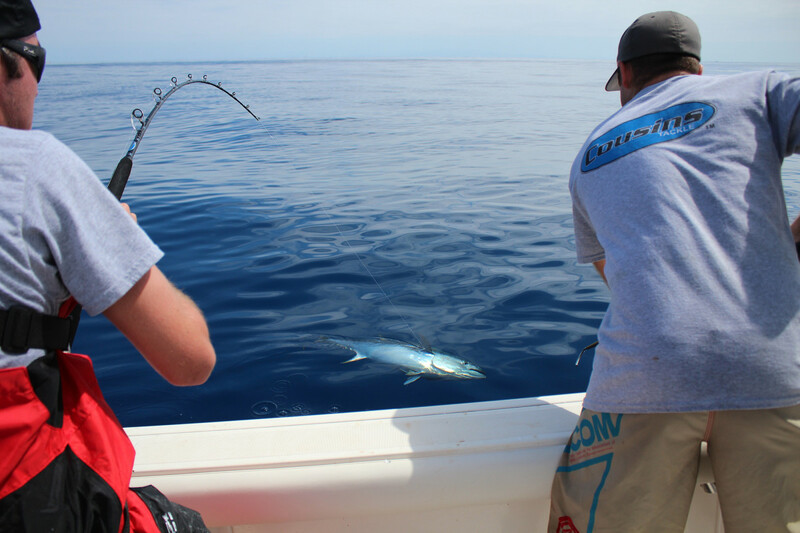 Low-frequency CHIRP allows anglers to search the water column and read bottom in depths of 4,000 feet or more. High-frequency CHIRP does an excellent job of presenting structure detail and individual fish detail in relatively shallow water. Many of the top sounder and MFD manufacturers provide transducer information and recommendations on their websites. Airmar (airmar.com) and Gemeco (gemeco.com) have graphics to help laymen understand this technology. Gemeco also has a free app called iNstall to help anglers select the right transducer. And you can never go wrong seeking advice from a dealer who is certified by the National Marine Electronics Association. Contradictory worldviews collide along a river in Montana, where a guide wrestles with heady questions of conservation, ethics and hypocrisy. Take A Close Look At The Thoroughly Modern Convertible. 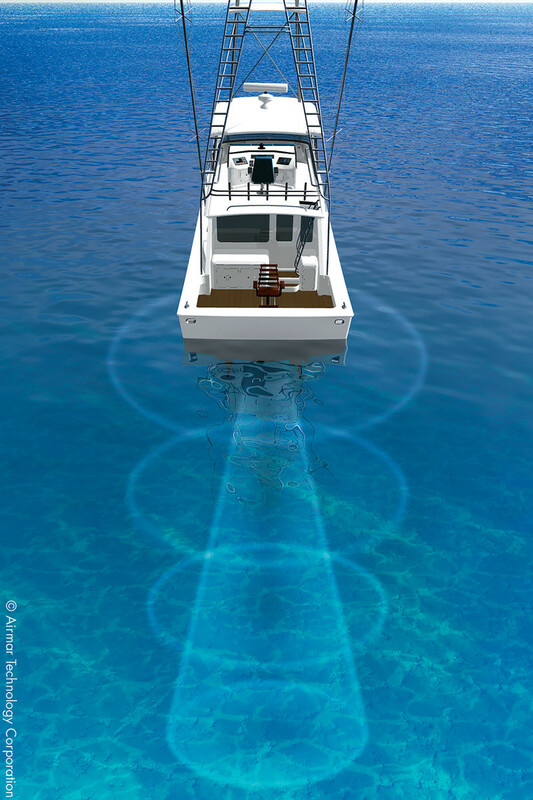 Serious anglers looking to up their game are turning to professional-grade sonar, which has the ability to see 360 degrees around the boat and detect fish from a quarter-mile or more away.